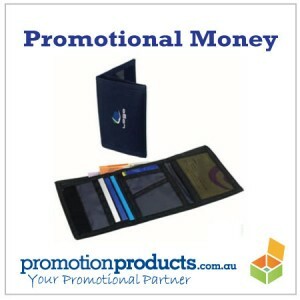 When I first started working in promotional products, the last item I imagined selling would be the promotional wallet. Is nothing sacrosanct and safe from the constant push to print and embroider everything that moves? No, and that’s a good thing for all of us. It’s the quirky, odd, unusual promotional products that gain the highest retention and usage. They’re also highly likely to weave their printed message into the psyche of anyone who owns one – after two years, 70% of recipients can spout who gave them promotional gifts and recount the printed message. The figure is higher with items like promotional wallets. Whenever you leave the house, what are the items you instinctively grab? Keys, Sunnies, Wallet/Purse – absolutely! Aside from the fact all of them may be a promotinal product, designed to maximise brand exposure, they’re imperatively important things, each with a purpose and connection to the owner. When I take my money from an ATM, I know exactly where it’s going – into my wallet, the purse that has “Virgin” printed on the side (cue for a Richard Branson joke – he never tires from them, does he?!). I know my wallet and I have a deep connection with it because I look at it every day, several times, usually wondering where that money from the ATM went…. This entry was posted in business gifts, Promotional Items and tagged branding, keyrings, novel by admin. Bookmark the permalink.